Two of the American League’s best face up this weekend in the ALDS. The Detroit Tigers are coming into the Bronx tonight to face the New York Yankees. Their hopes rest on the shoulders of Justin Verlander, but let’s be honest – there isn’t a pitcher in baseball you’d rather have as your teams ace right now. Verlander is coming off one of the best seasons a pitcher has ever put together, including his 2nd career no hitter. Verlander matches up tonight against Yankee ace CC Sabathia (19-8). The Yankees have complete faith in Sabathia, the ’07 AL Cy Young winner, who is no slouch himself. There is no question that pitching will decide the victor in this ALDS, as game two’s matchup is an exciting one too – Doug Fister vs. Ivan Nova. Since becoming a Tiger, Fister sports an impressive 8-1 record, while Yankee rookie Nova (16-6), has looked like a veteran all season long. There is no question this will be an exciting series, and I predict the winner of the series will end up in the World Series. In case you were wondering how much more expensive it’s going be to see a game in this series, we compared regular season and postseason home ticket prices for the Yankees and Tigers. 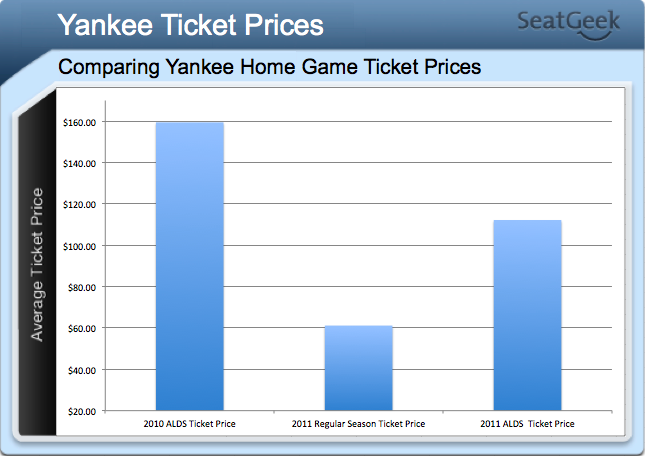 Yankee home ticket prices from the 2010 ALDS, the 2011 regular season, and this years ALDS. While it is about $50 more to see the Yankees in the postseason than the regular season, this years ALDS prices are almost $50 cheaper than last year! Jump on those tickets Yankee fans, I’m sure going to. 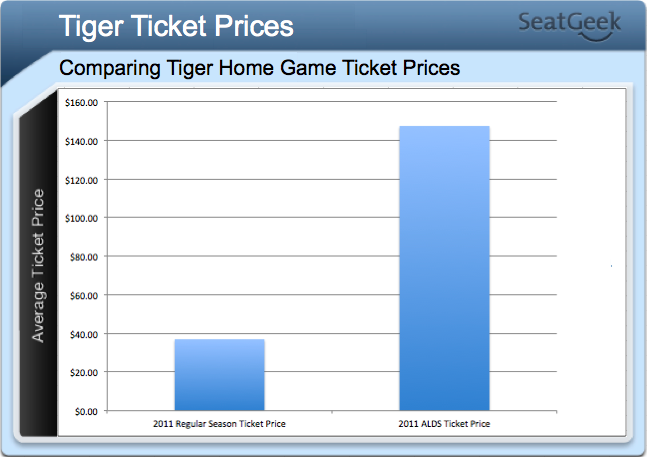 Tiger home ticket prices from the 2011 regular season, and the 2011 ALDS. Tigers postseason tickets are 4X more expensive than regular season games! Probably because Tiger fans haven’t gotten a chance to see their Tigers in the postseason since their World Series run in ’06 when they fell to the Cardinals. Pull the trigger on those tickets Tigers fans, it might be a while before you get another chance. Check out all the 2010 playoff ticket price comparison. Get all your 2011 playoff tickets here.